Is an al-Qaeda Front dominating 3 Million People in North Syria? 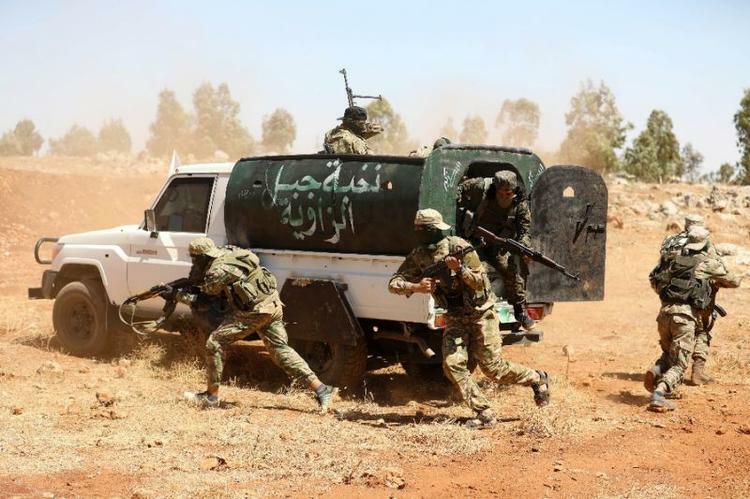 Paris (AFP) – The jihadist group now controlling Idlib province in northwest Syria claims to have broken with Al-Qaeda, but analysts say that despite several rebrandings there’s no sign it has changed its stripes. Hayat Tahrir al-Sham (HTS) sealed its hold on Idlib last week after signing a ceasefire with what was left of rival factions in the region. Over time, HTS has changed both names and leaders, and statements posted on the internet suggest it had severed ties with Al-Qaeda, the Sunni Islamist terror group founded by Osama bin Laden. But many experts dismiss such claims as smoke and mirrors, saying the organisation is simply attempting to muddy the waters and confuse intelligence agencies. Jabhat al-Nusra, the rebel faction which gave birth to HTS, announced in July 2016 it had broken with Al-Qaeda. But this was just “rebranding while maintaining a secret pledge of allegiance,” said Hassan Hassan, who specialises in jihadist movements at the Washington-based Tahrir Institute for Middle East Policy. “Throughout its numerous iterations, HTS has not altered its ideology and is still widely thought to maintain links with Al-Qaeda,” Hassan told AFP. “HTS maintained links with Al-Qaeda’s loyalists in northern Syria and even allocated areas and resources for its supposed rivals,” he added. A number of jihadist groups in Idlib still officially pay allegiance to Al-Qaeda, led by Ayman al-Zawahiri, an Egyptian, since Bin Laden’s death. These include Hurras al-Deen, a faction comprising a few thousand jihadists including Syrians and foreign veterans of the wars in Afghanistan and Iraq. The group also includes members of the Turkestan Islamic Party, a jihadist group dominated by Uighur fighters, according to the Syrian Observatory for Human Rights, a British-based monitor. Hurras al-Deen fought alongside HTS when it took control of Idlib from other rebel groups backed by Turkey. HTS claims more than 25,000 fighters, according to the Syrian Observatory for Human Rights. “There are a number of indications suggesting that HTS has only staged its ‘break’ from Al-Qaeda,” Filiu said. “That’s one of the main reasons Turkey failed in Idlib, as it had hoped the so-called ‘Syrian’ faction of HTS would help neutralise the jihadist elements,” he added. Jabhat Al-Nusra might have sought to distance itself from Al-Qaeda since an association would put its fighters in the cross-hairs for US airstrikes. “While HTS proclaims that it is an independent entity not affiliated with Al-Qaeda, the organisation grew out of Al-Qaeda’s Syrian affiliate, Jabhat al-Nusra, following a series of strategic rebrandings,” the US-based Soufan think tank said Monday. “Throughout its numerous iterations, HTS has not altered its ideology and is still widely thought to maintain links with Al-Qaeda,” said the research and advisory group, set up by former FBI anti-jihadist agent Ali Soufan. HTS has extended its administrative hold on Idlib under its so-called “Salvation Government” after years of cultivating grass-roots ties with local residents. On Monday, Syria’s National Coalition, the leading exiled opposition group, branded the HTS a “terrorist organisation,” a designation applied by the [twitter account of the closed] US embassy in Damascus since May 2017. “The core of HTS is Nusra, a designated terrorist organisation. This designation applies regardless of what name it uses or what groups merge into it,” the embassy said in a tweet at the time.